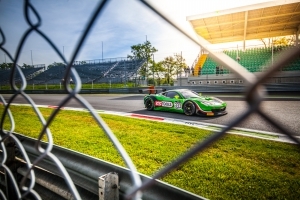 In spite of a strong performance Norbert Siedler missed a top-ten-result at the Blancpain Endurance Cup’s season opener. After a brake issue in qualifying the Austrian and his team-mates Marco Seefried and Rinat Salikhov fought their way through the field. But a drive-through-penalty after a small mistake from Salikhov made a better result than the 17th place impossible. 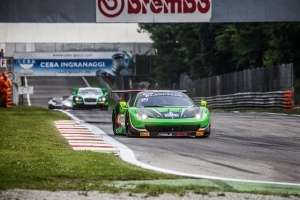 Norbert Siedler travelled to Monza with a lot of confidence: One year ago the Tyrolean had claimed the pole-position at the same track and had finished the race in second. But problems with the brake system in qualifying made a repetition impossible: “I had to fight with blunt weapons, the problem cost us a few tenths of a second every lap,” Norbert Siedler said, after he had secured the 24th starting position in the 57 cars grid. The qualifying was quite close: More than 30 cars were within a single second. 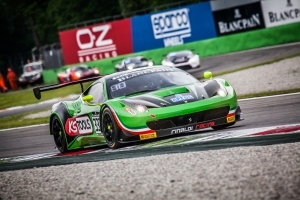 Nevertheless, Norbert Siedler was optimistic before the three-hour-race: “The fast track in Monza suits our Ferrari and overtaking is possible here as well. A great race is in front of us.” The Austrian was right: When Marco Seefried entered the pit-lane after one hour to hand the car over to the young Russian Rinat Salikhov, the Rinaldi-Racing-Trio was already among the first ten cars. Already at the next weekend Norbert Siedler has the next event on his schedule: At Sachsenring season’s races number three and four of the ADAC GT Masters are held. In the “League of Dream-Sports-Cars” Siedler shares a Lamborghini Huracán GT3 with Jaap van Lagen.